Maison Fahrenheit offers tastefully furnished rooms with an eclectic fusion of ultra modern and vintage decor. Located in Victoria Island, the commercial hub of Lagos city, the hotel is within a close proximity to many of the city’s famous attractions. There are 26 uniquely decorated rooms and 4 suites with a varied mix of Svengali’s trademark exquisite and sassy colour combinations at Maison Fahrenheit. The rooms are relatively spacious and airy with abundant natural light, ocean views, mod cons and pristine designer bathrooms. Rooms also have a mini bar and in-room tea/coffee making facilities. Maison Fahrenheit features an onsite restaurant that serves menu and buffet options. The bar is fitted with 3 large TV screens and it is the perfect place to relax and mingle while enjoying classic cocktails, wines and soft drinks. Features a king size bed with high quality bed linens, in-room safety deposit box, working desk with reading lamp and bathroom amenities. The room is ideal for guests on a budget who still desire a room with good measure of comfort and luxury. The suite features luxury interior designs, a lot of the items in this room specifically depicts an exotic lifestyle, you’d love it. 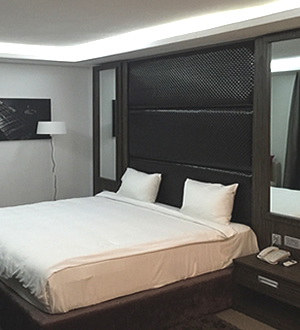 The room features upgraded room furnishings and bathroom amenities, internet access, king-size luxury bed etc. 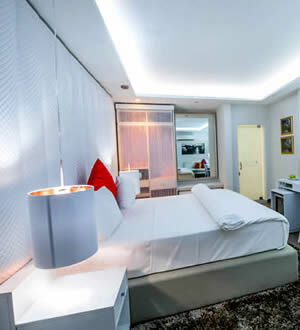 Features stylishly large rooms, HD flat screen TV with cable TV. The room is the perfect blend of beauty, comfort, and luxury. Each room features bathroom amenities, premium quality furnishings, superior decor and many more. Home away from home, best choice for guests who desire only the finest things in life. Spacious with a comfortable living area. Other facilities include well appointed exotic furniture and room decor, spacious bathroom and power shower etc.